One of the best things about going on a vacation and staying in an all inclusive resort is no cooking! Now that our beloved Chef Oscar is back, we would like to remind you of all of the dining options that Hacienda Tres Rios offers in order to assure you have a relaxing and delicious vacation. Eat what you like and as much as you like. Casa Las Islas provides a family friendly atmosphere and dishes from around the world. El Alebrije is the pride and joy of Hacienda Tres Ríos. This fine dining restaurant blends the exotic flavors of authentic Mexican cuisine with the traditional decor of Jalisco, Puebla and Michoacán. 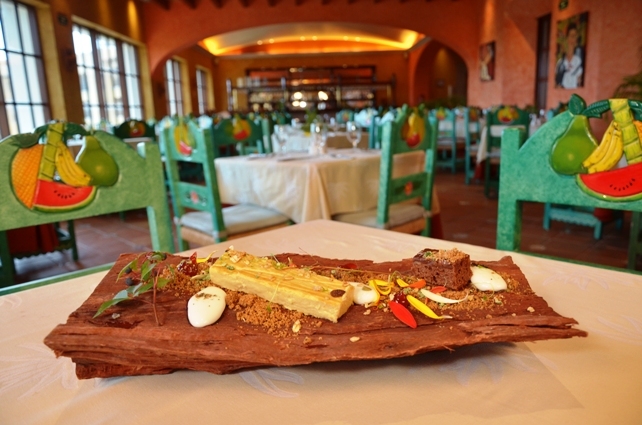 Enjoy the delicious flavors of a Mexican gourmet buffet for lunch. The Hacienda Grill sits poolside and offers a full bar and food menu, which includes salads, burgers, wings, sea bass, shrimp, steak, tasty desserts and more. In the morning enjoy our invigorating juice therapy. This casual, outdoor restaurant by the pool offers specialty pizzas and calzones baked in a wood-fired brick oven. The menu features pizzas and calzones. Imagine a blend of Chinese, Japanese and Thai foods. The result is savory Asian fusion cuisine. Kotori offers sushi, Thai and teppanyaki dishes. Save room for a delicious dessert like passion fruit cheesecake. A guest favorite! Enjoy the enticing scent and heavenly flavors of fresh baked cookies, pastries, specialty desserts and full-bodied espresso, latte, coffee or tea all day, every day. Italian dining at its finest in the heart of the Riviera Maya. Dishes are prepared using the tastiest combinations of Italian seasonings and sauces. After dinner, indulge in delectable desserts like almond truffles, mascarpone with vanilla sauce or caramelized pistachio cannolis. Please check our website for days and hours of operation. Visit Hacienda Tres Rios and dine at all of these restaurants. See our Specials & Packages here.